Have you seen those 3D pens online that form ink into hard threads as you “draw” to create shapes off of a work surface? Most of the time, the videos featuring the pen are full of people wondering why these pens exist, and then trying and failing to build a rudimentary sculpture out of it. Well, Nissan Europe saw the pen and thought of an opportunity to show off the Nissan Qashqai Black Edition. Artists and engineers came together to create the world’s largest 3D pen sculpture with the 3Doodler 3D pen. 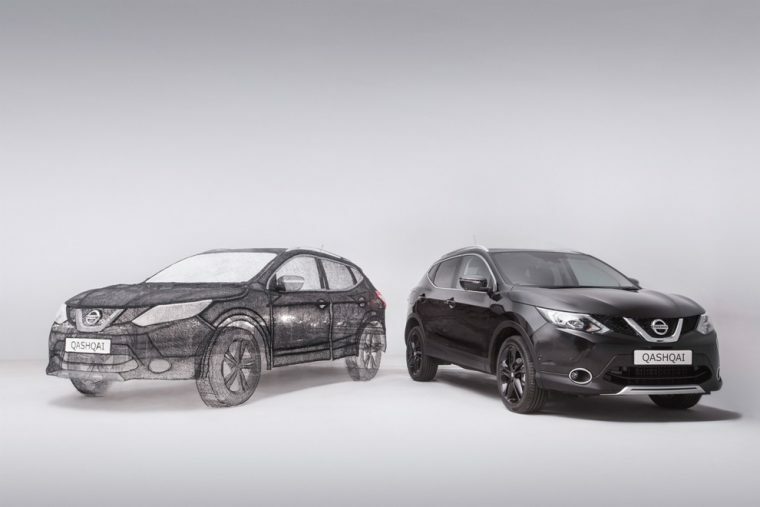 The sculpture isn’t just a model of the Nissan Qashqai Black Edition, it’s fully to scale. The artists building the sculpture used more than 13.8 kilometers of plastic ink strands to build the car and 800 hours of work. Take a look at the video below to get an idea of the painstaking detail that had to go into creating this sculpture, as well as the consideration for the strength of the building material. Buyers who are interested in the Nissan Qashqai Black Edition should get a move on, because only 3,360 of the model will be produced. Now if only someone would make something genuinely useful with these 3D pens.